Scenario planning, also called scenario thinking or scenario analysis, is a strategic method that some organizations use to get to grips with the broader contextual uncertainties that the organization faces when making strategic or major investment decisions. It is a way to better understand the complexity of the future business environment. As such, the scenario narratives that result from such exercises may be referred to as ‘memories of the future’. They provide a meaningful framework for discussing the key trends in the contextual environment and their implications for business decisions. The energy industry faces much more uncertainty than say 10 to 20 years ago. The energy transition is a sure thing, but how fast will it go? What is the remaining outlook for oil? Will power generation be as decentralized as some are suggesting? Will gas indeed act as a transition fuel, or will this be short lived as the pace of development of renewables continues to surprise? Will CCS ever take off as an accepted emission mitigation strategy? We do not have the answers to these questions, neither will others. What can be done however is to explore such questions by means of scenarios. In the workshop we will show how companies or organizations can develop and use them. The workshop is a two-day interactive engagement with lectures and group work around some ‘live’ scenario concepts being used in the energy industry. Scenario development methodologies will be discussed and practiced as will the use of scenario thinking for decision making. 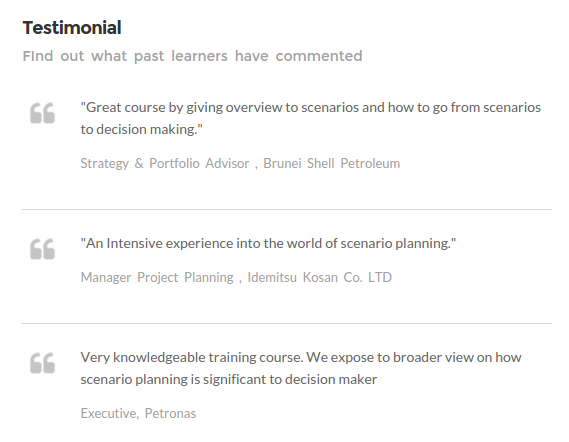 After the workshop participants will have a good understanding of the scenario analysis approach. Prior and after the workshop participants will get access to an e-learning component for maximum learning effectiveness and value.